1st prize winning for Singapore members. Congratulation to those who won this number on 20 May. A long list of winners shown in our webpage. 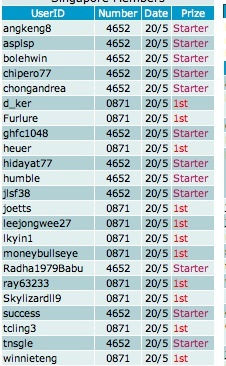 More and more top prizes winning for Gold members as we perfect our numbers selection each draw. Upgrade your membership to receive the top prize number every draw. Call 92300837 to know how to do it.